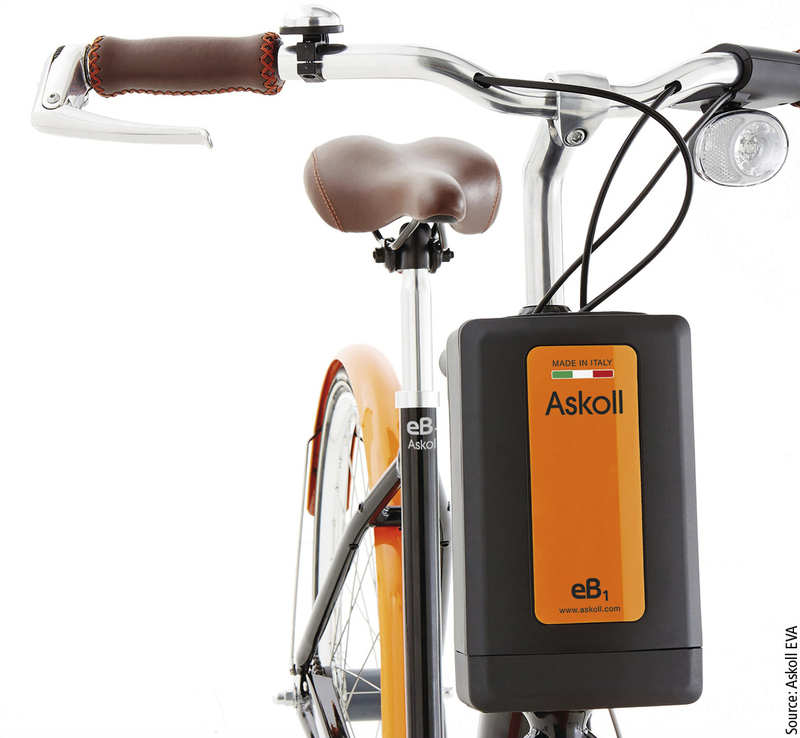 Askoll is one of Italy’s leading manufacturers of electric two-wheelers. The company has specified the use of Thermolast K from Kraiburg TPE for two precision gasketing applications on the new battery boxes of a growing range of power-assisted bikes and electro-scooters. The company based in Dueville near Vicenza is using the TPE material for an anti-rattle overmoulding of the battery connector and for water-tight sealing of the battery box. Key requirements to be met included a direct adhesion to glass-filled PBT on small contact surfaces. Electric vehicles need innovative materials that support their pleasantly silent travel by eliminating undesired ambient noises and – in the case of external components such as battery boxes on two-wheelers – ensure a weatherable and water-tight enclosure. This is opening attractive new application opportunities for thermoplastic elastomers. Electric vehicles need innovative materials that support their pleasantly silent travel by eliminating undesired ambient noises. Both TPE applications – the anti-rattle cover of the battery connector and the sealing of the battery – are injection moulded in a two-component process, which required good direct adhesion to the glass-filled PBT resin used for the battery box. Good flowability was needed to ensure a precise, tight and faultless fit of the gasket on the narrow contact surface of the lower box component. In addition, the compound lends the critical long-life mechanical properties required to withstand the shocks and vibration of the box when driving, as well as the wear and tear during frequent removal for charging the maintenance-free battery on the electric grid at home or at work. The compounder has also expanded its product offerings for the production of soft-touch decorated surfaces with low-emission, low-odour, and UV-resistant compounds that are easy to process. The company said that the compounds of the new FG/SF Thermolast K series comply with all established automotive standards set by OEMs with regard to the emission and odour behaviour of components for vehicle cabins including DIN 75201-B (G) and VDA 278 on fogging and VOC (volatile organic compounds) as well as VDA 270 Var. 3 (odour behaviour dependent on temperature and climatic influences). In addition, the compounds provide permanent UV stability, which is confirmed by comprehensive independent tests in accordance with DIN EN ISO 105-B06. Hardness grades ranging between 50 and 80 Shore A are available. They offer very good adhesion to PP in two-component applications and provide an attractive satin-finished surface with a pleasant soft-touch feel and permanent abrasion resistance.